Valentine’s Day is here once again with its celebration of love, friendship, and chocolate. If your kids are still in elementary school, chances are they will come home with nearly as much sweets as they did last Halloween. They might also have an exciting class party that will include cookies, candies, and more sugary treats. This extra sugar can lead to cavities and other oral health problems. It is important to teach your kids proper brushing and flossing habits so that they can prevent cavities regardless of the additional sugar. Here are some tips and tricks that you can teach your children to help them properly brush their teeth and to make tooth brushing more fun. Brush your teeth for two whole minutes. It may be helpful to download a tooth brushing app that will keep track of the time for you. Teach your kids to brush their teeth twice a day and after eating. Remember to brush the tongue, too. If you don’t have a toothbrush handy, rinse your mouth with water or chew sugar free gum to help loosen food particles. Floss your teeth at least once a day, or anytime you feel you have something stuck between your teeth. Only use floss to remove food particles from your teeth—do not use toothpicks, hair, string, fingernails, etc. Tooth brushing should never be a race. It is more important to thoroughly brush your teeth than to beat a sibling or a parent. Healthy dental habits are just like eating healthy or exercising regularly. It is important to follow them from an early age! Turn brushing into a game by letting your child take turns brushing your teeth or the teeth of a beloved stuff animal or doll as well as their own. Go to the store together and pick a toothbrush with their favorite character. Find a kid friendly toothpaste that is a flavor your kids enjoy, so they will be more likely to brush their teeth. If you would prefer to have a dental health professional teach your child how to brush your teeth, set up an appointment with Dr. Hines today. 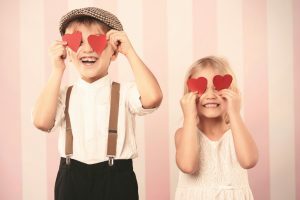 During your scheduled appointment with your Columbus pediatric dentist, we will review proper brushing and flossing techniques for healthy teeth at any time during the year but especially around Valentine’s Day.